At 888casino we welcome you in style. Join today and get off to a fantastic head-start on your online casino adventure with a whopping 100% up to €140 instant Welcome Bonus! Double the money, double the fun and double your luck! You can use your Welcome Bonus to play on any of our great casino games, including exclusive Slots, Jackpots and Live Casino Games! 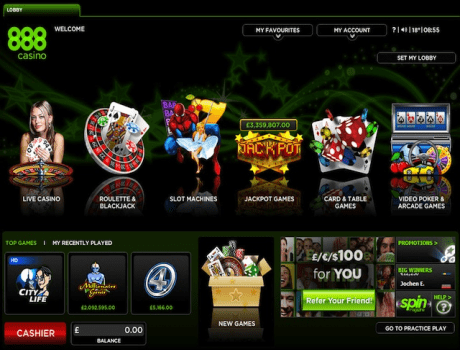 Consists of a 100% instant bonus up to £100/€140/$200 provided immediately upon deposit. Bonuses (Welcome Bonus and others) and any winnings derived from a bonus may be withdrawn only after an amount totalling no less than 30 (thirty) times the initial bonus amount received has been wagered, unless otherwise stated (40 (forty) times if the bonus amount if received by funds deposited by NETeller, (except for players from Japan where the wagering for the bonus is 20 (twenty) times the bonus for first time deposits made via NETeller). For example, to withdraw each bonus of $10 and any related winnings, a member needs to wager $300 and the entire bonus criteria must be fulfilled. Wagering on all games at 888casino contributes towards the wagering requirement but certain games contribute greater amounts than others. For members located in certain jurisdictions, territories and states, certain bonuses (including the Welcome Bonus) may not be available and there may be different wagering requirements for withdrawal of bonuses and any accumulated winnings.